Why 8" x 8" - because if we're knitting just a 4" x 4" swatch, we're probably hurried - and the cast on edge is part of our calculation - and we just wanna start... the 8" x 8" makes me slow down a bit - to relax; and knit the way I knit... and hopefully it'll be a better indication of what my knitting will measure in the final product. 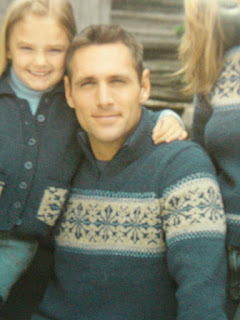 it's a gorgeous sweater that Gregg wants me to make for him - from a book by Patons #500993 "Indigo Days" that I picked up at Bishops this past summer... I'm using Louisa Harding Kashmir Aran yarn - and it's sooo nice to work with! I love that blue!! A bigger swatch is definitely going to be able to give you more accurate information than a small one. I also block my swatches - not necessarily pinning it out to the measurement that I want it to be, but definitely wetting it up and laying it flat to dry. Measuring it dry then after blocking will give more information - does the yarn/fabric change - stretching or shrinking? This is especially helpful if the intended recipient plans on washing the garment. That sweater is gorgeous and I think all the hard work you're putting into it will be worth it in the end. First, how do you get the guy in the picture! Holy smokes! 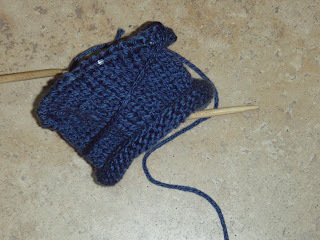 Next, some people say you should block the swatch also to get accurate measuring. I have also realized that swatching is very important. It has become habit for me at this point. Congratulations on finishing the pie wedge shawl! You must be glad to have that off your mental list of UFOs. Can't wait to see it! The snowflake sweater looks like a great next project. I agree that a swatch is the way to go to make sure after all that work that it fits. I usually do the 4 x 4 one, and last time the LYS advised me to wash it (cotton) to see what I ended up with before I started the project. You might want to try that too. Someday I'm going to learn that gauge lesson myself. I look forward to the FO. "Swatch"? What is it, this "Swatch"? Can you drink it?